Building more housing is critically important to our city’s continued economic growth. Every new unit built in Oakland – at any income level – helps relieve the housing shortage, as well as create jobs and retail spending. Oakland’s business community has seen firsthand the economic benefits of what happens when people choose Oakland. Increasing our city’s housing supply to meet the rising demand to live and work in Oakland is a critical part of creating jobs, supporting local business, and expanding Oakland’s sales tax base. The Chamber believes that the best way to raise money for affordable housing without discouraging new development is to phase in the fee over a 4-year schedule at increments of $5,000, $10,000, $15,000, and $20,000. Given current market conditions and indications from the City’s own economic consultant, this is likely the most aggressive fee schedule Oakland can tolerate. Some in the community are advocating to implement fees over 3 years at increments of $5,000, $10,000, and $20,000 per unit and exempt projects that submit building permit applications before Dec. 1, 2016, and some are advocating to implement fees well over $20,000 immediately. The Community and Economic Development Committee heard a brief summary of the staff report on development impact fees on Tuesday, Jan. 26, followed by public testimony from approximately 40 housing activists organized by East Bay Housing Organizations. EBHO speakers called for immediate impact fees at $25,000 with few pipeline project exemptions. The 7-8 non-EBHO speakers all called for a phased in approach generally maxing out at $20,000. Those speakers included the Chamber, Jobs and Housing Coalition, a BID leader, and others. Approximately 15 speakers also came to advocate to use a significant portion of the money raised for park improvements. 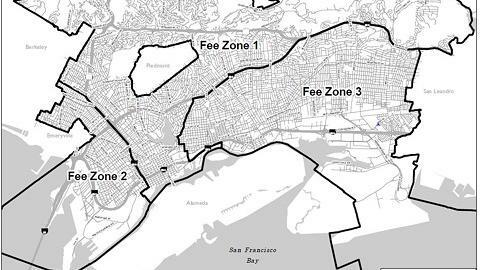 Read the Chamber's letter regarding impact fees to the Oakland City Council here. The city held the final two working group meetings on Dec. 10 and Dec. 14 during which city staff discussed more details of the proposed impact fee program. A third proposal from working group member and planner with Alameda County Angela Robinson Piñon was also discussed. These proposals, along with a run-down of past working group proposals, are shown below. City staff also released a memo giving an overview of the issue and summary of what has been presented at the working group meetings. The full staff report will be released by Dec. 31 in advance of the Jan. 12 Community and Economic Development Committee meeting. After committee, the full council may take action on the report the following week but staff estimates that the timeline for adoption of the fee ordinance wouldn’t be until sometime in in March 2016.